DBN is a dynamic business networking group with a growing membership and an active programme of events throughout the year. 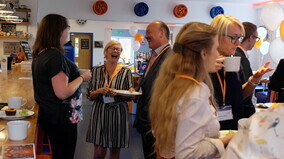 At DBN we aim to make networking a friendly and enjoyable experience but with the important purpose of making new contacts and winning new business. Our primary aim is to help your business to grow through networking. We ensure that members are kept informed about news in the area through our monthly Newsletter. “Derwentside Business Network is a great network to be a member of as everyone is so friendly and helpful and always there for any business advice if you need it. The meetings are always different, informative and quite often fun . I would recommend joining the network to all SME's in Derwentside"